Although The Connected Home feels increasingly like its attracting the interest of those who are not nerds, rich folk and/or early adopters, there are only two areas to date that have really thrived. One is Alexa and Google Home, soon to be joined by Apple's take on home AI, and the other is security cameras. I'd best lay my cards straight on the table and say I do not think there is much value to this type of indoor camera, other than to shoot candid footage of your kids and pets. As far as home security goes, there is no deterrent value to having a camera in your house because, by definition, no stranger knows it's there. Its usefulness in terms of securing an arrest or prosecution is questionable, and I think psychologically it does more to engender paranoia than peace of mind. If you do fit a camera and – god forbid – one day there's an intruder on your phone screen stealing your stuff and doing a poo on the coffee table, you can at least phone the police and they will attend, contrary to popular belief. Whether they get there before the intruder has departed, however, who knows. I still have the horrible suspicion that a lot of users of cameras of this type would feel the need to go and intervene themselves, with consequences that are… not ideal, let's say. Anyway, all that said, if you do want a camera of this type, the Netgear IQ is about as good as it gets. Of course, given its price, which is almost double that of the last Nest Cam, and nearly triple that of something like the old Logitech Circle or Nokia (Withings) Home, it damn well should be. This really is an exemplary product in terms of setup. Unbox, plug in via a lengthy USB cable that fits seamlessly into the base, open the Nest app, click the big + button and scan the QR code on the base. Well, obviously if you don't have the Nest app you'll have to download it and set up a Nest account. But that's still perfectly straightforward. The Cam IQ is quite an attractive thing and feels premium and weighty. You can crane its neck up or down and even when looking down from a great height, the heft of the base makes toppling unlikely. A standard tripod screw on the base makes mounting simple. However there is no weather proofing, so the Cam IQ can't be fitted outside. You could set it to look out of a window of course, although technically speaking, that is illegal unless you put up a sign letting passers by know that you are surveilling the area. Security also seems sound, with 128-bit AES with TLS/SSL secure connection and the option of two-step verification of any account changes, with an essential code being sent to your specified mobile device to be entered before any change is allowed. This is where the IQ really earns its high price. The sensor here is of 4K resolution. For streaming purposes, that is downgraded to full HD, the same as most other cameras of this type, but the quality is, in general, noticeably higher. This is, of course, subject to the quality of your home Wi-Fi and your mobile's 3G/4G/Wi-Fi connection at any given time, especially if you're watching live streaming. Seen on your mobile via the Nest app, footage can easily be paused, panned and zoomed, and if you have Nest Aware (more on this shortly), the software also makes a pretty good stab at auto zooming on any humans it detects. Don't worry, as well as showing a zoomed view, it is still filming the full frame, and you can switch easily between the two. The 4K sensor is also used at full resolution to capture still images of people it spots. Now admittedly 4K only equates, in this case, to an 8 megapixel still, but it still gives clearer and more identifiable results than most such cameras. Video footage is stored in the cloud for three hours or, with a Nest Aware subscription of £8 or £24 per month, 10 days or 30 days respectively. £24 per month is just crazy in my opinion, but it's your money. The real question here is, do you really need that greater clarity? For security purposes, maybe not. In most cases, you'll be able to tell if that person in your house is a familiar face or an intruder even at lower resolution. Theoretically, a clearer face shot might be useful in subsequently securing an arrest or conviction, but if they're wearing a mask, all you'll have is a higher resolution view of their balaclava. Cam IQ works effectively as a two-way communications device thanks to an excellent mic array and very clear speaker. There is a bit of a time lag over a 3G/4G network, but it's usually acceptable. Over Wi-Fi, you could use the IQ as an intercom quite easily, to call your kids to dinner or what have you. It's kind of an expensive solution compared to just shouting, but there we go. Night vision is also seriously impressive, and unlike on older cameras, there's very little in the way of visible infra-red light to give the game away to burglars. 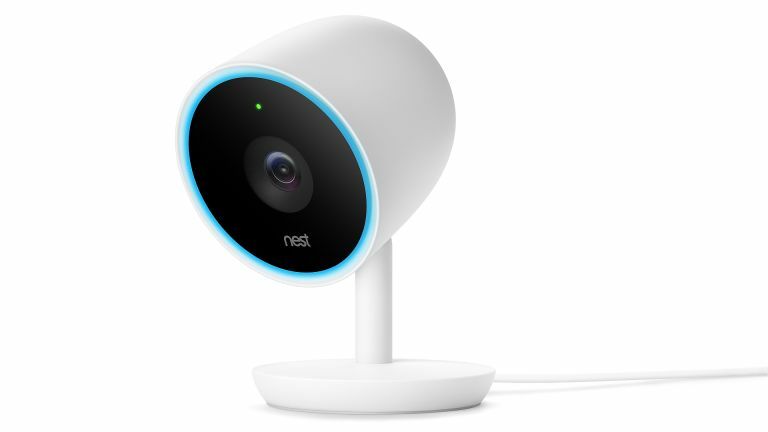 It was something of a bone of contention with the original Nest Cam that it really required an £8 per month (or £80 per year) subscription to Nest Aware to make it useful. That's because smart alerts were impossible without one. Any movement of any kind – household pets, a plastic bag blowing past the window, even a shadow moving or appearing as the sun moves – would trigger an alert, which gets old pretty quick. Nest Cam IQ, because of its much greater processing power, is able to recognise that a shape is a person and notify you only when it spots a person, as opposed to your cat or robot vacuum cleaner. This does reduce the number of alerts you get. However, you are still going to get alerts every time any one of your housemates, family or friends comes into view, and in a busy household, that also gets old fast. The same goes for if you set it up to snoop on the road outside. On a busy street, it'll pick up anyone walking by and let you know. So realistically, you do still need Nest Aware, and every Cam IQ comes with a free 30-day subscription, to get you hooked on it. That's because this cloud-based service offers a raft of features that really should be included as standard. These include detection of familiar faces and even being able to individually name them (although not in Illinois, where they're clearly touchy about computers getting too clever). I've only had this IQ up and running for 3 days and it's already pretty good at recognising me and my boyfriend, and has stopped notifying me every time I walk into my own office. Yes, you can turn off notifications when you're at home entirely, but I left them on for ease of testing. Nest Aware also allows you to set specific zones within the camera's field of view that it scans for people, excluding everything else. Doorways are an obvious example, and, when pointing your camera out of the window, the area immediately in front of your door, so you pick up visitors but not passers-by. Getting these zones the right size and shape throws up some problems, but it's definitely helpful. Arguably less useful, Nest Aware also lets you be alerted by sounds – specifically dogs barking or human voices. The Nest Cam IQ is a great piece of hardware but not something I'd use for home security personally. One obvious little trick that Nest has missed out on is including an alarm element. It makes the Protect smoke alarm; why couldn't its cams trigger that when an intruder is detected? That could be either an automatic function, although that would almost certainly lead to false alarms, or by you firing it via the app after being alerted. This is not an idea I have just made up, it's functionality included in Bosch's new suite of connected home devices. For keeping tabs on your family, in a non-sinister way, the Cam IQ probably does have its uses. In my opinion, the need to know exactly where all your loved ones are and what they're doing at all times is more like a kind of sickness than being a concerned parent, but you may have a different view. With its ability to recognise familiar faces (albeit only with Nest Aware), Cam IQ is ideal for getting those reassurances about your loved ones. Less useful but more valuable, these kind of cams are all great for capturing video and stills of kids and pets at play, or doing amusing things that may earn you many likes and shares on Youtube. This one just happens to do it at higher resolution and with greater clarity than all its rivals.